June 8, 1979 Signs a five-year, $3.25 million contract with the Celtics shortly before he would've reentered the NBA Draft. At the time, it was the largest rookie contract in sports history. Celtics retained their exclusive right to sign him until the 1979 NBA Draft, because of the NBA's "junior eligible" rule that existed at that time (allowing a collegiate player to be drafted when the player's original "entering" class was graduating and giving them one calendar year to sign them, even if they went back to college). Shortly before that deadline, Bird agreed to sign with the Celtics for a US $650,000 a year contract, making him at the time the highest-paid rookie in the history of the NBA. Shortly afterwards, the NBA draft eligibility rules were changed to prevent teams from drafting players before they were ready to sign. The rule is called the Bird Collegiate Rule. 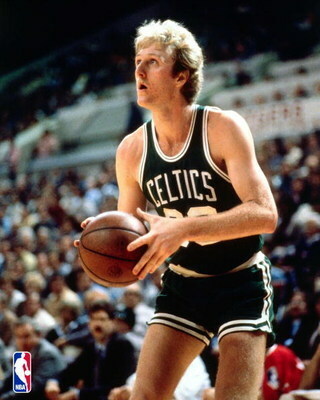 On June 8, 1979, Bird signed with the Boston Celtics. The contract netted him $3,250,000 for five years -- at the time the largest rookie contract in NBA history. During his years with the Celtics Bird grew to become one of the greatest talents in the NBA. He led Boston to three NBA championships, won numerous MVP awards, and is credited with again making the Celtics a formidable franchise. The year before Boston gave Bird the largest rookie contract in pro team sports history, the Celtics went 29-53. His first season, the Celtics went 61-21. No coincidence. Bird was All-NBA first team and averaged 21.3 points, 10.4 rebounds, and 4.5 assists per game. he shot 41 percent from behind the 3-point arc. In nine playoff games (the Sixers eliminated the Celts in the Eastern Conference finals) his stats were nearly identical. Bird was an almost unanimous choice for ROY, picked on 63 of 66 ballots -- not bad considering Magic Johnson was also a rookie that season.